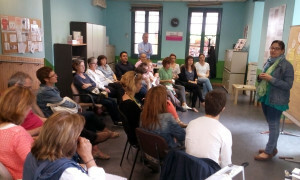 On Saturday 18 June more than twenty people inside and outside Down Catalunya met in Barcelona to discuss and jointly analyze about the strengths and weaknesses of the organization, its successes and failures, its opportunities and threats. This pooling, organized and energized by the consulting Momentum & Co, specialized in the third sector, should serve to guide the path to be followed by Down Catalunya over the next four years. Attendees included members of the boards of Down Catalunya and five of its entities (Andi Down Sabadell, Aura Foundation, Down Lleida, Down Tarragona and Astrid 21 Foundation). 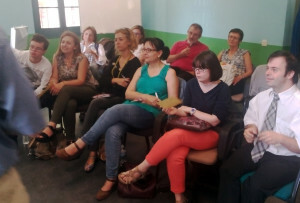 They were also attending technicians from Down Catalunya and some of the entities, as well as three young people with Down syndrome coming from Aura Foundation and Down Lleida. In addition, we invited people who do not belong to any entity, but who have collaborated with Down Catalunya in some specific project or who know the reality of Down syndrome in Catalonia as parents or as drivers of other initiatives to improve quality of life of people. The debate, which lasted for more than three hours, allowed to review the entire journey made by the coordinator since its inception in 2004 to the present, and put on the table the different views of participants on issues such as networking between the different entities or the defense of the rights of people with intellectual disabilities, and especially with Down syndrome. Before this sharing, consultants from Momentum & Co held individual interviews with some of Down Catalunya responsibles in order to get an insight view of its work, and from all this will emerge “a document that should serve as a roadmap for the team running Down Catalunya’s day to day”, explains Xavier Estivill, senior partner and director of Momentum & Co. This document is not yet closed. If you want to make any suggestions, ideas or criticism you can do so by writing to info@sindromedown.cat putting in the subject “Strategy 2016-2020”.